A new version of the series is being planned for showing on Fox. Set in the 1950s with a female Buddhist monk searching for a stolen child. Pilot has been written by Wendy Mericle of "Arrow". Several sites are reporting on this. The pilot is going to be made but where it goes from there will depend. More information soon. The Complete Series from Amazon at $59.99 (about $20 a season) / 44% off regular retail price and no shipping. Or the Third Season available from Amazon.com for $14.99 (63% off) Note: this season seems to be Region Free which works for those inside as well as outside the U.S. & Canada. Amazon now has a note up that the DVDs will be "In stock on June 15, 2009." And the sale prices (60% off sets of individual seasons) are still available as of today. The Complete Series from Amazon at $63.99 (about $20 a season) / 44% off regular retail price and no shipping. Or the Third Season available from Amazon.com for $15.99 (60% off) Note: this season seems to be Region Free which works for those inside as well as outside the U.S. & Canada. Amazon seems to be getting a lot of requests for the sets of the series so that though they continue to offer the seasons at $15.99 as of today (see below under May 20 for links), they need to get in more copies and have up this note for the season sets: "Usually ships within 7 to 13 days." Also available at a deep discount: Circle of Iron. 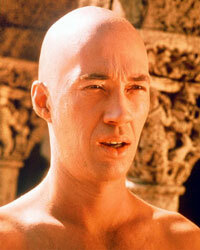 We are saddened by the death of David Carradine. All three network news programs made a note of it remarking that he was best knows for the 1970s TV series "Kung Fu" ("Kill Bill" was also mentioned across the programs). For the networks to all refer to a 40 year old TV show illustrates the ongoing significance of this series in popular culture although maybe not as much for those born in the years since. 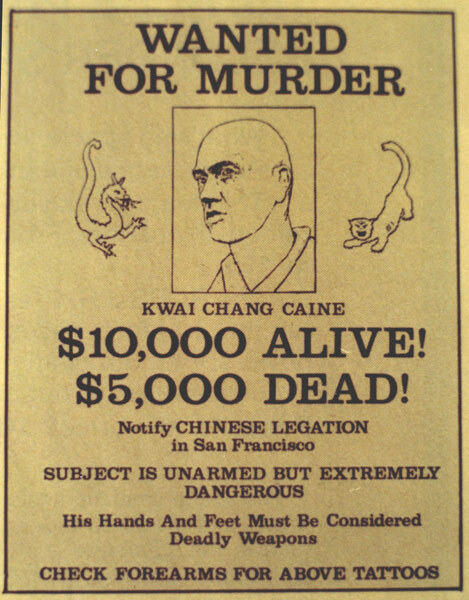 Carradine will be missed, but Kwai Chang Caine is still with us. See the opening credits for the first episode that gives the background before the character comes to the "American Old West". The Sale on the Complete Series for $45.99 has ended but if you missed it, it has a slightly higher price and there are new sales. Get all three seasons together for a sales price of $47.97. And the individual seasons for $15.99 each. Or the Third Season available from Amazon.com for $15.99 (60% off) Note: this season seems to be Region Free for those outside the U.S. & Canada. Special offer on each of the above seasons pages, go down a little to see link for all three seasons for $47.97 and no shipping. Special Sale on the Complete Series for $45.99 (about $15 a season) no shipping charge. From Amazon - Could end at any time. Amazon no longer has the new Season 2 or the complete series DVD sets on sale. For some reason Amazon has the Second Season on Sale: Second Season available from Amazon.com for $15.99 (60% off). If you only get that there would be shipping added ($2.98, I think). There also seem to be some used ones on sale. Another deal Kung Fu - The Complete Series Collection for $45.99 (60% off). Free Shipping. Cheaper than the used versions. Comes out to about $15.33 each season with no extra charges for shipping or tax. 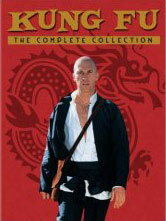 Kung Fu - The Complete Series Collection for $35.99 (69% off). Free Shipping. Ran into two related things this past week: 1) Spike TV has done a two part thing called "Kung Fu Killer" with David Carradine that isn't quite as bad as the name suggests in fact it is very similar to the original series in some ways. Spike offers a teaser. We assume it will be on again. And CBS Evening News did a report on the Shaolin Temple and the abbot, who uses a computer and flies around the globe to arrange financing for the temple. First Season available from Amazon.com for $15.49 (61% off). Second Season available from Amazon.com for $16.99 (58% off). Third Season available from Amazon.com for $17.49 (56% off). Note: if your order consists of at least $25, shipping is free. We have a third report (see March 28 note below) that the Amazon UK import of the Third Season in Region 1 is really Region Free. Jérôme: "I want to tell you that I live in France (region 2), I have ordered the DVD season 3 in the USA (via Amazon.com), and it works normally here on my computer! "The irony is that I had bought DVD Region Master to be able to read them, so I was choosing Region 1 each time, and of course it was working. When I read the news on your site, I tried to read them without the software... and, yes, to my great surprise, it worked ! And it still works ! I could have saved $40." We have a second report (see March 28 note) that the Amazon UK import of the Third Season in Region 1 is really Region Free: A.J. in The Netherlands wrote, "I too would like to mention and confirm that the third season of Kung Fu is absolutely playable on PAL televisions and region 2 DVD players! I got fed up waiting for the region 2 version of the DVD's so I took a chance and purchased the region 1 set. I couldn't believe my eyes to see them play splendidly on my tv! I've waited years for that." We have been told that at least one copy of Season Three in Region 1 works on Region 2 machines. Our contact thinks these were made Region Free. The Amazon sale of the DVDs seems to be over and they are now offering them back at 25% off. Image from TV Shows on DVD has information that makes it look like there will be a set issued of all three seasons for the U.S./Canadian/Region 1 Market. Coming out in November (just in time for Christmas) but with no new content. This may be why the individual season DVDs went on sale. First Season available from Amazon.com for $15.99 (60% off). Second Season available from Amazon.com for $15.99 (60% off). Third Season available from Amazon.com for $15.99 (60% off). A friend sent us a link to a story on a new Shaolin group in San Francisco authorized by The Shaolin Temple. "A script was written for the movie version by Howard Friedlander and Ed Spielman" (who wrote the pilot). Script "will be rewritten by Cory Goodman, who also wrote the upcoming Andrew Douglas film Priest." The Hughes Brothers - Albert and Allen - will direct. Warner Bros.-based Legendary Pictures'Thomas Tull, Scott Mednick and Jon Jashni are producing; series creator Ed Spielman executive produces. "The brothers were among several hip directors who coveted the 'Kung Fu' job, and it was an assignment they sought for two years. WB production prexy Jeff Robinov, who gave them the job, agented them before he became a studio exec." The plan to start production next year and have a 2008 release. "Goal is a 2008 release that will help foster WB's expansion into China and wrap nicely into promotion at the Beijing Olympics." "The producers have already reached out to the Shaolin Temple outside Beijing, where nonviolent monks train in martial arts and were the inspiration for the series protag, Caine. "FYI - Kung Fu is now on (since Oct. 1, 2006) what used to be PAX TV and is now i TV (http://www.ionline.tv/): It is on Sundays at 5 PM central time." 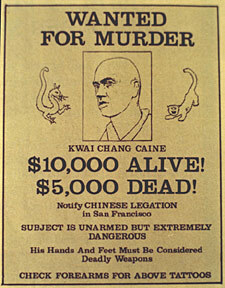 "...The Shaolin monastery has featured in scores of Hong Kong and mainland martial-arts films, but outside China it is best known as the place where Kwai Chang Caine, or Grasshopper, played by David Carradine in the US series Kung Fu, studied the lessons taught him by Master Po and Master Kan...."
"'Kung Fu' Is Coming To The Big Screen Grasshopper!" "The new treatment will reportedly be set mainly in China and centers on Caine's training to become a Buddhist martial arts master and the subsequent events that lead to his departure. "Ed Spielman, the original show's creator, and one of his writing partners, Howard Friedlander, are in the process of writing the screenplay. Casting has yet to be announced." "So far, no director or cast has been announced, but film bosses have confirmed that Carradine, now 69, will not be returning to the project, nor will it be an effects-laden movie." "Kung Fu, the movie, will explain why Caine fled China, and will take Chinese tradition seriously. "'We're not looking at this as 'Crouching Tiger, Hidden Dragon,' with people flying all around,' producer Scott Mednick recently told Reuter. 'The actual priests of the Shaolin Temple can do things that are amazing without wire work or special effects.'" "When completed, the screenplay is to be passed on to Warner Brothers, who the producers hope will give the project the green light." The editors of this site have come out with a site about a new show (just finishing its first season): The "House MD" Episode Guide to the Fox TV Series. If you are not watching and you are at all a fan of the Sherlock Holmes stories, let us recommend this Fox show which starts reruns May 31. The main character is a worthy descendent of Holmes. But his enemies are not deadly criminals as you would expect but deadly germs, diseases and vulnerabilities of the human body --- and the writers of this series make that interesting. But it is the character of House that holds the series together like it was the character of Sherlock Holmes that makes those stories fascinating. which is the clearest we have seen. Joe Darrow, of Canada, has the following tapes purchased from Columbia House and he is ready to get rid of them but doesn't want to spend the time selling them on ebay and doesn't want to just throw them away. He has contacted the Canadian Post Office to see how expensive it would be to send them to the U.S. and he figures it would be about $41. So if anyone of you out there would prefer to have VHS tapes of the following episodes and are willing to pay that for the shipping, please contact him at halder@look.ca to make arrangements (we assume that if a Canadian wanted them shipped to a Canadian address, the cost would be less) and if no one wants the entire collection, he might agree to send off individual tapes. "With more episodes to follow (we are working on part 2 right now). "I thought this news might be of some interest to the visitors of your site and those who enjoyed the series that influenced us so much." "In the extras we learn that David Carradine started doing his own stunts for this [the second] season." We are starting a new feature on the site. We would hope to have something every week or so --- sometimes more often, sometimes less. We have discovered that some of the third season episodes are currently available on VHS tapes. If you look through the third season episode pages, you will see on the right on some pages an image of a video tape and under it the names of two episodes. Click on the image or the titles of the episodes and go to Amazon which currently offers a tape with those two episodes. We are continually being asked when the Third Season will be out on DVD. First let us admit that we have no inside information. We hear about a release at the time it is first announced --- about three months before the release date. There are rarely any rumors going around before that first announcement. Amazon will normally put it up for pre-order about a week after the official announcement. But at a guess, using the past as a guide, we would guess that the complete third season will be out on DVD sometime between the Fall of 2005 and the Spring of 2006. It depends on a number of things like: how many other DVDs Warner Brothers is making ready for release at the same time, whether they have any trouble restoring the best original that they have, how the sales are going of the previous releases, whether they decide to cut the episodes to do widescreen nor not, what extras they plan on, etc. Few people have all the infomation on all of these things to be able to predict when the release date will be --- at the moment probably no one knows when the date will be, although they probably have an idea of approximately when they would like to release the next (and last) season.